Explosion-protected crane technology is used in many branches of industry: in the chemical and petrochemical industries, in mining, power generation, food and pharmaceuticals. With its highly developed solutions, STAHL CraneSystems leads the world market for explosion-protected crane technology. Since developing the first explosion-protected crane components in 1926, the company has contributed significantly to the success of the whole branch of industry and to the development of today’s industrial standards. Not least thanks to its own fundamental research, a vigorous R&D department and countless technical achievements in the fields of crane technology and explosion protection. Nowadays, apart from an enormous range of products, the company offers services: from consulting to engineering to dealing with approval and certification procedures for our products for individual countries. 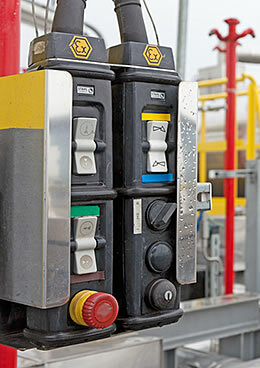 In addition to the applicable safety directives, explosion-protected hoists from STAHL CraneSystems meet European ATEX regulations. Since 2010, the products have also been certified in compliance with the internationally sought after IECEx scheme. This is of assistance when issuing other national certificates: equipment with corresponding certification can be commissioned without further testing in countries which recognise ATEX or IECEx – a great advantage for international customers.